- You'll notice that there is a new "Print All Recipes" button in the Jump To Navigation menu. Hopefully this saves some of you .pdf / print folks a few clicks / a few sheets of paper. If you buy the dark, chopped kale from Trader Joes, this bag benefits from a de-ribbing. Tedious? Yes, but it yields a much better salad texture. I empty the bag into a large bowl, turn on a podcast, and rip away the thick stems. Then I’ll go at the bowl with kitchen scissors to get smaller pieces. You can also buy brussels pre-shredded but they use all the stems and tough core and I just don’t like them. You can get much thinner, enjoyable results from a mandolin, or again, rip the cores away from a bag of pre-shredded ones. If you want a pop of holiday color, add pomegranate seeds. I wrote this to serve a larger group, in honor of gatherings this week. Use just one bundle of kale if you want a smaller salad. make ahead: The dressing and pecans can be made in advance. The kale, brussels and fennel can be trimmed and chopped a day in advance, and kept in a big bowl with a damp paper towel and plastic wrap on top to keep it crisp. use it twice: Make extra dressing to have for the week, and also if you like your salads very well dressed. The pecans work in most fall vibe salads, and are great on top of roasted vegetables. carnivore addition: You can always add shredded rotisserie chicken, or another favorite protein, if this is going to be the main course. dairy free: Skip the gruyere. For the sweet & spicy pecans. Preheat your oven to 350’ and line a baking sheet with parchment. In a large bowl, combine the warmed butter or oil, maple, sugar, dash of cayenne and cinnamon, salt and give it a quick whisk. Add the nuts and toss to coat. Transfer them to the parchment and bake for 5-6 minutes. Remove to cool completely, they will crisp as they cool. Stored in an airtight container, they will last a week. Using a mandolin or super good knife skills, shave the brussels sprouts thin. Discard the tough ends and center if you can avoid them. Collect them all in a big salad bowl. Chop the kale thin, add to the bowl. Shave or slice the fennel thin, as well as the apple (or cut into matchsticks! ), and add them to the bowl as well. Shake all the dressing ingredients together in a jar with a lid, or whisk together in a bowl. All these components can be made in advance if you need to travel with your salad. Add the nuts, cheese, dressing and toss together just before serving. Easily multiplied, but I wanted to start moderate in case this was going to be a simple dinner instead of a meal for a holiday. I use delicata, as it’s tender delicate texture, edible skin and quick cooking time work great here. You can use acorn or a small butternut and simply add some cooking time to that first roast of the squash. If this is acting as the main course for dinner, I’ll add some chopped greens into the rice pilaf to wilt just a little and be part of the stuffing. I am giving directions if you have wild and brown rice independently. At most grocers, Trader Joes included, you can find a wild rice blend, and simply follow the directions on the package and then proceed with the other vegetables. There will be more filling than you need, as the pilaf will also be going into the soup! Keep it covered in the fridge for up to 5 days. make ahead: the squash can be roasted in advance and kept covered in the fridge. The rice or the complete filling can also be made up to three days in advance. Assemble the squash and warm together just before serving. Garnish as noted. carnivore addition: brown some sausage in with the celery and onions. dairy free: skip the cheese garnish. The pecans from the salad would be good on top here too. low carb: a cauliflower rice swap would be fine. Preheat the oven to 400’ and line a baking sheet with parchment. Arrange the squash cut side up, and rub a little bit of oil on the flesh side. Roast for 20 minutes to just soften. Remove to cool. Cook the rice according to instructions. I usually go 4:1 (water to rice) for the wild rice and 2:1 for brown rice. You can cook them separately, or boil them like pasta and drain, starting the wild rice first, and adding the brown rice halfway in. The wild rice will start to “pop” open when it is ready. In a large saucepan, heat the oil or whatever fat you’re using. Add the celery, onions, pinch of salt and sautè until translucent, about 3 minutes. Grate in the garlic cloves, add the dried cherries, broth, cooked rice and sautè another few minutes until most of the liquid has absorbed and the cherries have plumped. Turn the heat off, stir in the herbs, another pinch of salt and pepper and the cider vinegar. Taste, and adjust seasoning as needed. Spoon the rice mixture into the squash cavity. You will have some leftover filling intentionally for the soup, about 3/4 cup. 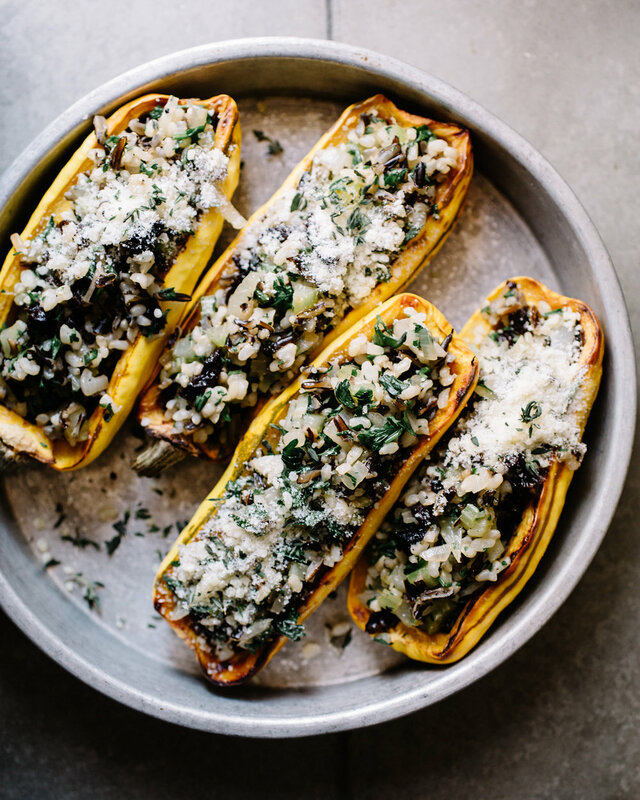 Pop the stuffed squash back in the oven for 5-10 minutes to warm through. Garnish them with a sprinkle of cheese, fresh pepper and another sprinkle of herbs. I’m guessing after Thursday evening, you will want out of the kitchen. For my overseas friends who do not celebrate Thanksgiving, you can just use a classic or store-bought rotisserie chicken that has been shredded. Leftover poultry is generally really dry, but rehydrating it in a good broth, turns all these leftovers into something super easy and comforting. This time of year I’m using a lot of broth. I generally use store-bought to be honest, but it is true what they say, homemade makes a world of difference. I will direct you towards Ina Garten’s recipe - super easy and foolproof. I use the Organic Better than Boullion which they sell at Costco, but Cooks Illustrated (my most trusted source for recommended products) says Swanson is the best store-bought option. Clearly not one for semantics, I use the word stock and broth interchangeably fyi. 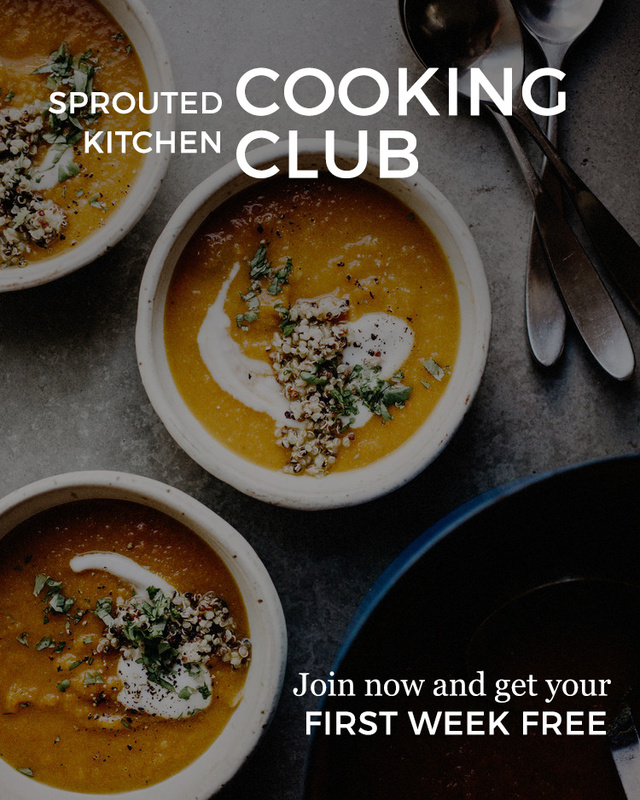 If you don’t eat poultry, or want to skip it, the vegetarian swap is offered below. make ahead: the soup is ideally composed of things you have already made ahead (the turkey and rice pilaf), but you could chop vegetables to save a few minutes. The entire soup can be made and saved for up to five days. I imagine it would freeze well. kid friendly: for some reason, mine aren’t great with super brothy soups. This does lean on the stewy side, but for my kids, I’ll basically just pull some of the mixture out of the broth with tongs, so they essentially just have chicken and rice, without all the liquid if that makes sense. Cleo quotes “I really do not like these sticks!” in reference to the wild rice, but she finished the whole thing. vegitarian option: add 2 cups of small cubed, butternut squash in place of the poultry here. Add it in the same place you’d add the meat, you will just need to add about 5 minutes to the sautè time, and another 10 minutes to the simmer time to be sure the squash is cooked through. dairy free: skip the cheese garnish. In a large dutch oven, heat the olive oil over medium heat. Add the leeks, pinch of salt and sautè about 5 minutes until softened. Add the leftover turkey, or chicken, depending if you are using this as a post thanksgiving meal. See vegetarian sub below, add the butternut squash here if using. Sautè another minute, add the broth, bring it up to a boil, then down to a simmer. Add the rice pilaf, put the lid on partially, and let it all simmer together for about 15 minutes. Add the chopped kale and let it simmer another 5-10 minutes until the kale is just tender. Serve your bowls with an optional sprinkle of cheese and fresh bread. The soup can be stored in the fridge for up to five days or frozen. Feta sold at most major supermarkets is generally made with cow’s milk, because it is cheaper, but it is SO much better to use one made with sheeps’ milk (as it is supposed to be!). They sell two at Trader Joes, one in brine and another in a green and yellow pack by Pastures’ of Eden. You should be able to find a sheep’s milk based one at most any market that has a cheese section. One of my smart testers tried this with soft goats’ cheese in place of the cream cheese and loved it, so know that is a great swap if that is what you stock. Make this swap on the grocery list. make ahead: the pom relish and whipped feta can be made a day in advance, and kept covered in the fridge. use it twice: the pom relish can be repurposed into a green salad. The whipped feta would make a great vegetable sandwich spread, or alongside falafels or other Mediterranean type meal. If you are making turkey sandwiches with leftovers, this would be amazing there! Stir in the pom relish to store, no big deal. gluten free: serve the feta and pom relish with endive leaves, or use a gluten free cracker. In a large bowl, combine the pom arils, jalapeño, shallot, oil, vinegar, a big pinch of salt and pepper, and stir to mix. Add the herbs and mix again. This can be made a day in advance, and kept covered in the fridge until ready to use. Into a food processor, combine the cream cheese, feta, olive oil, lemon zest and juice, and run it about 30 seconds to combine. With the motor running, drizzle in the water, salt and pepper (about 1/2 tsp.of each). It should look fluffy, but does not need to be completely smooth. This can also be made in advance, and kept in a covered container in the fridge.